Naturalized in southern Australia, New Zealand, eastern Europe and most of the US and Canada, including California. Besides California, it is naturalized in areas of the US, Canada, and southern Australia that are similar to California. Present in 8 California counties. Invasive in lakeshore dunes in Michigan, where it comprises 80% of the vegetation in some areas and overstabilizes dunes that were typically disturbed by wind (Emery 2013). Changes the physical structure of the habitat. Also invasive in mixed-grass prairie in Wyoming and listed as a noxious weed in California and Washington (Blumenthal 2008). In 2006, it was considered for the Cal-IPC Inventory but its distribution in natural areas was too limited to warrant a review. Blumenthal, D.., Chimner R.. A., Welker J.. M., & Morgan J.. A. (2008). Increased Snow Facilitates Plant Invasion in Mixedgrass Prairie. The New Phytologist. 179, 440–448. Emery, S. M., & Doran P. J. (2013). 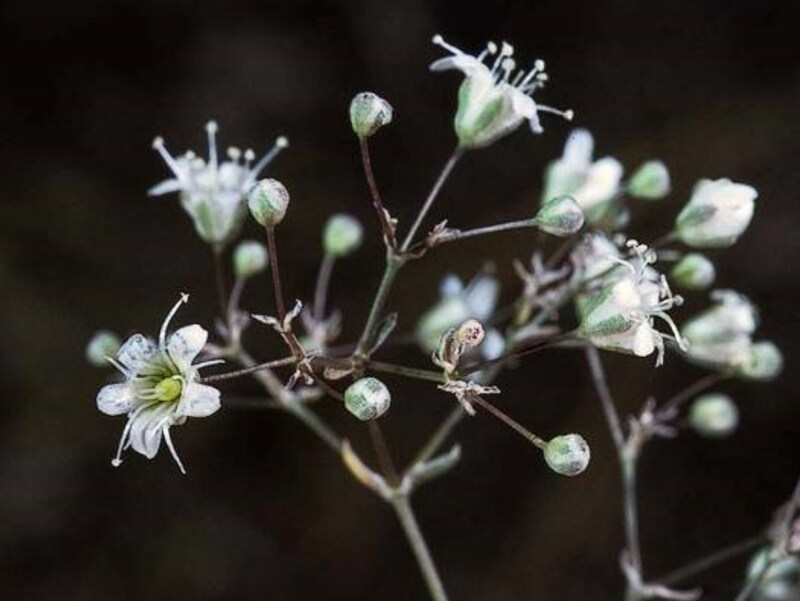 Presence and management of the invasive plant Gypsophila paniculata (baby’s breath) on sand dunes alters arthropod abundance and community structure. Biological Conservation. 161, 174–181. In California, grows in disturbed sites with sandy soils and in open, grassy areas. A B-rated noxious weed in California. Listed as a noxious weed in Washington because it forms dense stands in pastures and grasslands and is difficult to control. Escaped cultivation in both states. Two other species of Gypsophila are naturalized in California but apparently not causing many ecological impacts. Several other species are listed in Randall 2012 but the citations are all listed as naturalized rather than invasive. This species has a wide distribution in North America, Europe, and some in western Asia, Australia and New Zealand. Displaces lakeshore dune vegetation in Michigan and prairie vegetation in Wyoming. Forms dense stands in pastures in Washington. In Michigan, it creates a shift from a grass-dominated plant community to one dominated by forbs, i.e. mostly Gypsophila. No mention of this in references. It increases in areas with summer irrigation or snow (i.e. the water from snow provides moisture). No references mentioned toxicity but it forms dense stands in pastures and rangelands in Washington and is difficult to control there. It competes with forage species and reduces the crude protein content of hay. Forms dense stands in pastures and on lake dunes. Grows 3 ft tall with slender, open-branched stems, and sparse foliage. Photos show a fairly dense bush that would be difficult to walk through when many plants are growing together. Severed crown and rhizome pieces can generate new plants but root fragments do not generate new shoots. I'm a little uncertain of how to answer given the second part of that sentence. One plant can produce several thousand seeds. Information from Washington says one plant can produce more than 13,000 seeds. Newly matured seeds have little to no dormancy period. Flowers July to October in California. This does not seem to be a major form of dispersal. Most seeds fall near the plant but pieces of the plant can break off at the crown and tumble with the wind, scattering seeds longer distances. Wind was the only form of dispersal mentioned.